and Ethernet-based applications with PIC32MZ EF family devices. The PIC32MZ2048EFH144 PIM is designed to demonstrate the audio capabilities of the PIC32MZEF family of devices using PIC32 Bluetooth Audio Development Kit. A 200 MHz PIC32MZ2048EFH144 MCU with 2 MB Flash, 512 KB RAM, FPU, 48 ch. ADC, Hi-Speed USB, CAN 2.0b and 10/100 Ethernet is installed on the PIM. The PIC32MZ EF PIM is designed to demonstrate the capabilities of the PIC32MZEF family of devices using explorer 16 Development Board. It enables USB, Ethernet, and CAN development with PIC32MZ Series. A 200 MHz PIC32MZ2048EFH100 MCU with 2 MB Flash, 512 KB RAM, FPU, 48 ch. ADC, Hi-Speed USB, CAN 2.0b and 10/100 Ethernet is installed on the PIM. 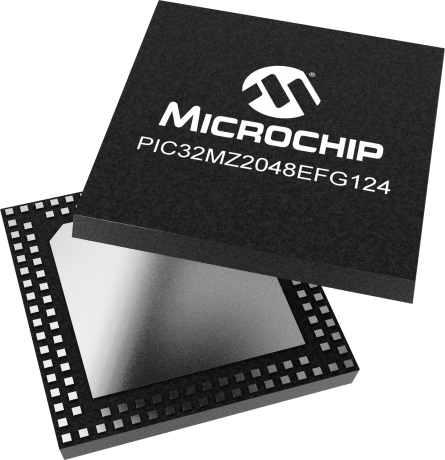 The chipKIT™ Wi-Fire board enables rapid prototyping with Microchip’s latest PIC32MZ architecture and Imagination Technologies' Flow Cloud Internet connectivity development software. Digilent is a trusted third-party tool provider.